The last friendly match booked for Real Madrid's schedule this season took place this Thursday night at the Riazor stadium. The Merengues defeated Deportivo de la Coruña by 0-4, with the goals coming in from Kaká (2), Morata and Casemiro. Cristiano Ronaldo has only played the first 45 minutes of the game. Real Madrid and Deportivo de la Coruña clashed at the Riazor last night for the annual Teresa Herrera trophy and the Merengues didn't have to sweath much to pull off an easy 0-4 win. Cristiano Ronaldo started the game, but got substituted for Angel Di María at half-time. The Portuguese didn't score any goal but assisted Kaká for the opener and still saw from the pitch-level both Morata and Casemiro granting the visitors a 3-goal lead very early in the game. Kaká would score his second later in the second half, closing a game that Real Madrid has never been in danger of losing control. Ancelotti's men will return to action next Sunday, as they are set to host Athletic Bilbao at the Santiago Bernabéu, for the 3rd La Liga fixture. The Merengues got off to a great start and it didn't take them too long to swing the net for the first time in the Riazor. Deportivo's defense was caught sleeping around the 6th minute of the game, which allowed for Cristiano Ronaldo to explore a big gap on the opposition's backline. The Portuguese proved his unselfishness and sent the ball over to Kaká, who had just arrived to help out at the far post. The Brazilian had a great first touch and then easily struck it past Depor's goalkeeper to make it 0-1 for the Spanish vice-champions. The second goal came shortly after, this time with Alvaro Morata showing others how it's done. Marcelo incorporated himself into one of the Merengues' attacks, combined extremely well with Morata and basically put him in front of goal with only the goalkeeper left to be beaten. The Spanish forward didn't miss the chance to prove to Ancelotti that he will be reliable choice for the rest of the season and struck it into the back of the net. Real Madrid added a third goal to their count around the 16th minute and it was another Brazilian who scored it. It wasn't Kaká this time but Casemiro instead, the defensive midfielder that the Merengues purchased from São Paulo. Isco took the corner kick on the left, Cristiano Ronaldo outjumped everyone else in the area, but it was Casemiro who made contact with the ball as he appeared behind CR7 to score from a header. The second half showed us a game with a lot less pace and without Cristiano Ronaldo on the pitch anymore. 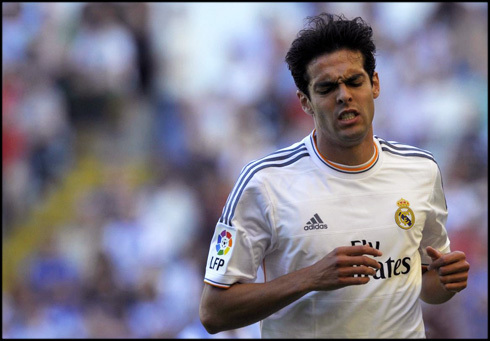 Kaká got to score a brace after a good counter-attack play from the Merengues, with Di María passing the ball over to Jesé in the center and the 20-year old back-heeling it to Kaká. The Brazilian midfielder, who admitted at the end of the game that he's expecting to be leaving the club in the next days, finished it off with a right-foot shot. 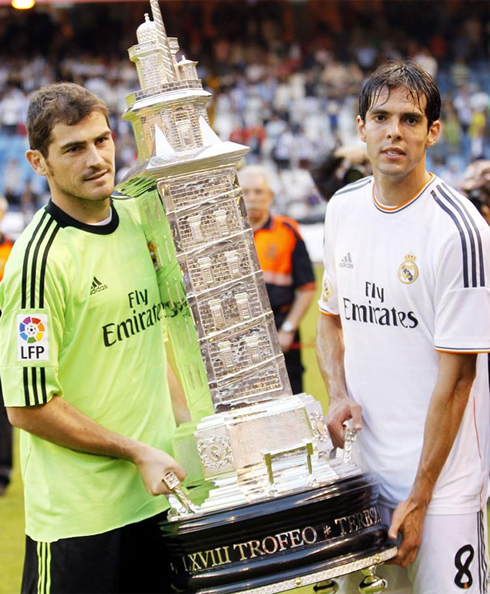 Real Madrid brought the Teresa Herrera trophy home, but more important than that, they've showed their support to Deportivo, as they have agreed to play this match without being entitled to receive any revenue whatsoever, as a way to support a club that is still struggling financially and has filed for bankruptcy in last January. As for Cristiano Ronaldo, in the beginning of the week part of the media suggested that the Portuguese player was going to miss this friendly match at the Riazor, in order to attend UEFA's gala for the "Best Player in Europe (2012-2013)" award, a ceremony that was held in Monaco this Thursday afternoon. The 28-year old forward decided not to show up in Monaco though and travelled with his team instead. As for the award itself, Bayern Munich's Ribery collected his first trophy of this kind, beating Barcelona star Lionel Messi and Real Madrid's forward Cristiano Ronaldo, on a live voting contest. The French player collected 36 votes, while the Argentinian was left with 13 and Ronaldo with 3. Cristiano Ronaldo next game for Real Madrid will be for La Liga against Athletic Bilbao, this next Sunday (September 1, 2013) at the Santiago Bernabéu. You can watch Juventus live stream, Real Madrid vs Athletic Bilbao, Valencia vs Barcelona, Chelsea vs Bayern Munchen and Arsenal vs Tottenham, all matches provided from our football live section.